The white of snow- capped Alborz mountain peaks. A fantastic and somewhat old-school atmosphere of ski resorts combined with unlimited free-ride and ski-touring opportunities. The turquoise of Persian mosaic covering mosque vaults, the hustle and bustle of tea houses, crowded markets filled with a myriad smells and colours. The wealth of magnificent Persian history. Smiling, open-minded, hospitable, and chatty people. These are the things which make Iran so attractive. 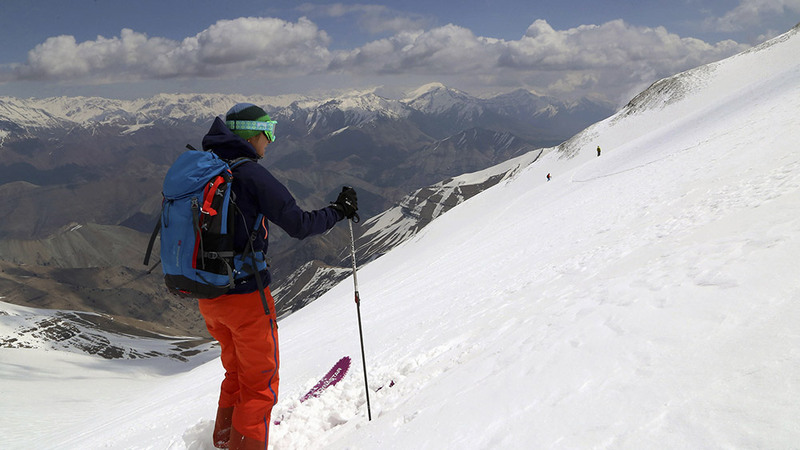 When thinking of skiing and riding in fresh powder, Iran hardly comes to mind first. Well, hold your breath. You just need to trust us! It really is a must-ski destination. It is a place that will remain in your memories for good! Iran is mainly a mountainous country. In winter, there are 20 ski resorts in operation. The biggest and most popular are Dizin, Shemshak, and Darbandsar (about 100 kilometres away from Teheran) as well as Tochal (located on the northern outskirts of the capital city). All of them are in the Alborz Mountains and still remain popular mostly with Iranians and Russians. The Alborz, also spelled Alburz or Elburz should not be confused with Elbrus – the highest mountain top in the Caucasus Mountains. As the mountains in Iran are very high (the Alborz highest peaks include Mount Damavand (5671 m), a dormant volcano, and Mount Tochal (3964 m), snow remains there for a long time. The skiing season in Iran normally lasts from November till April, but you can still enjoy the snow high up in the mountains in May and June. 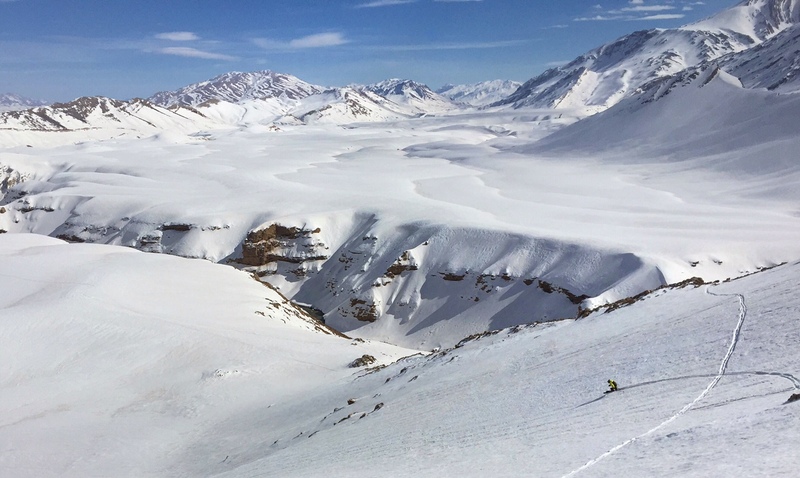 Ski touring fans can find their paradise around the 4000-metre mountain tops surrounding Damavand. These tops are often chosen as testing grounds before climbing the highest peak in Iran). Tochal. You arrive at the bottom station right from the bustling streets of Teheran. It takes 2 lift changes and 45 minutes to move 2000 metres up. Lifts take the skiers and snowboarders to the height of 3740 metres. The cityscape gradually vanishes and you start enjoying the stunning views of snow-covered mountains. Apart from the gondola lift, there are also 2 chair lifts, one T-bar lift and boundless off-piste opportunities. Mount Tochal offers a 12 kilometre arete or ridge. After a short climb up you get to its highest point (3964 m). 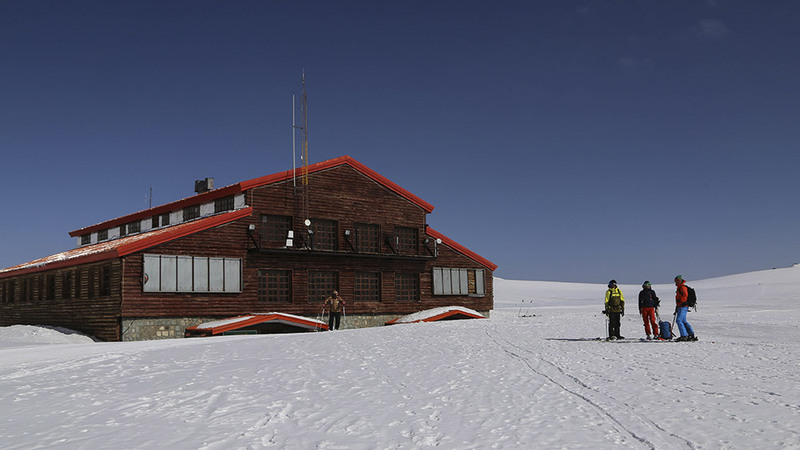 This is where the Tochal Hotel is located, exactly 3550 m above sea level, which makes it the highest located hotel in the world. Dizin. At first glance, it looks a bit like a toy shop window display. Pink egg-shaped gondolas move between bright yellow and green posts. There are drawings, pictures and graffiti. You must come and see it for yourself as, however strange it may seem, it is not allowed to take pictures of this amazing ski resort! This is probably one of the reasons why the biggest resort in the Alborz attracts so many tourists. There are 3 gondola lifts, 12 chair lifts, and fabulously wavy terrain which gives an impression of riding on sea waves. You go up and down, up and down between the highest point (3600 m) and the lower station (1000 m). It is a must-try place especially for those who are only starting their free riding experience. 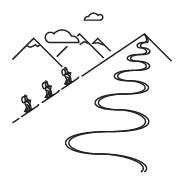 The slopes are not very steep and the variety of downhill routes to pick from is limitless. Worry not if you are a pro! We can assure you that you will not get bored. 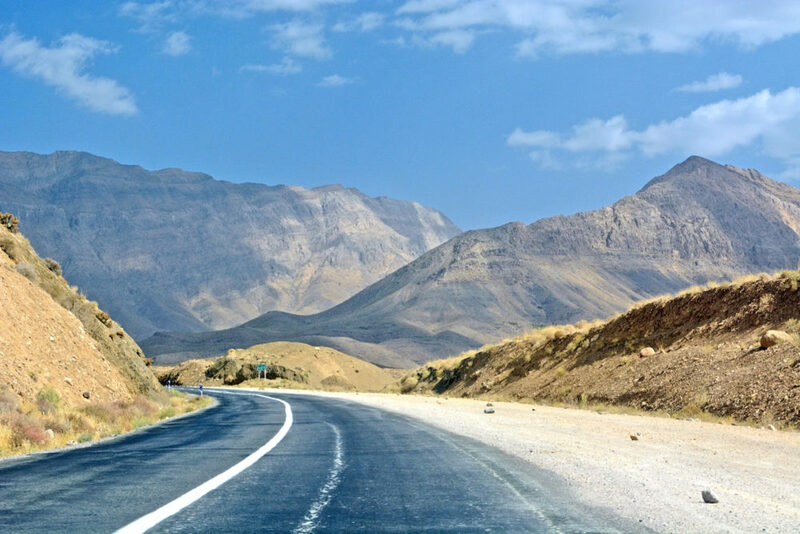 The resort is located about 100 km away from Teheran and you can reach it taking a curvy mountain road. When it is closed, you have no choice but take a longer route – about 3-hours long. Shemshak and Darbandsar located in the vicinity, are slightly smaller than Dizin, but they are famous for their fantastic free riding opportunities. Chill. The atmosphere of the ski resorts is relaxing and quite liberal as if the Islamic officials had little interest in controlling those places. Women are not obliged to wear hijabs or chadors. They simply wear winter hats. Iranians seem to be a lot more natural and free there than in the city of Teheran. Dizin is full of life and popular with open-minded young people coming mostly form the more affluent northern parts of Teheran who spend their weekends in the mountain resorts. 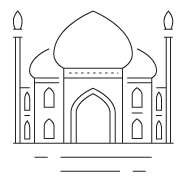 Nevertheless, each resort will ask the guests to obey the Islamic law. For example, in some places such as Dizin you are not allowed to take pictures on the slopes. Freeriding. 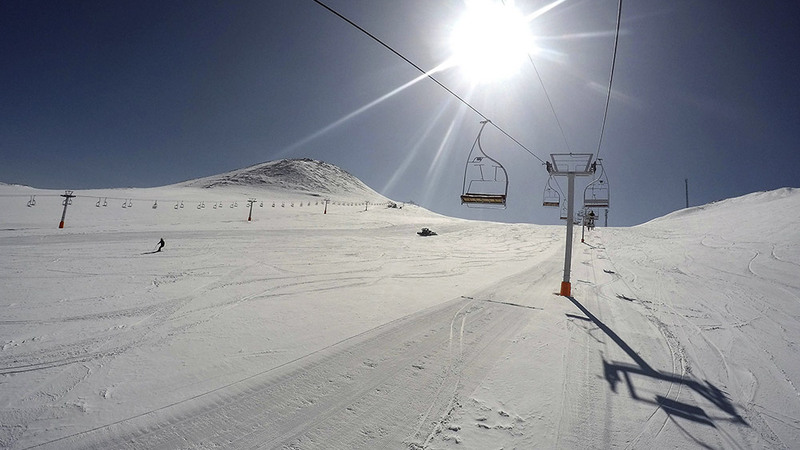 The opportunities offered on the Iranian slopes are just incredible! No wonder free-riding and ski-touring are growing in popularity there. 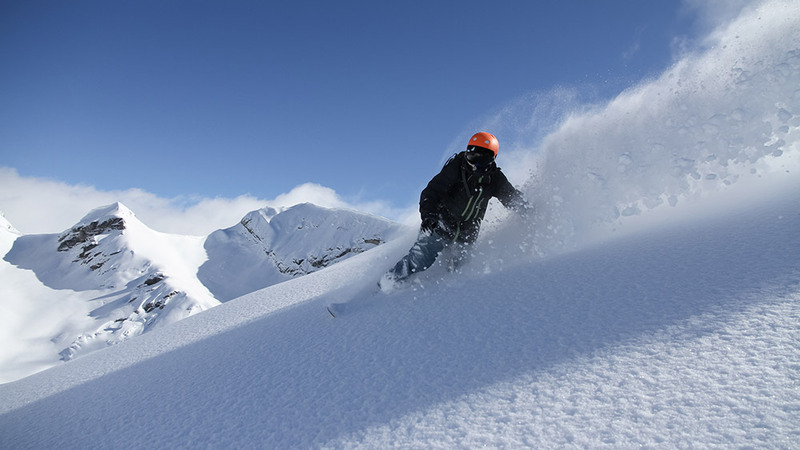 Skiers and snowboarders are attracted both by ungroomed areas around the lifts easily reachable from gondola lifts and wild Alborz mountain peaks above 4000 m with Damavand, the highest and most famous peak. Young skiers and snowboarders in Iran are also becoming more and more interested in backcountry riding. However, unlike in Europe, there is still little knowledge and training regarding avalanche risk and avalanche equipment. A few years ago Swiss riders and mountain guides together with Iranian ski instructor and guide Sina Shamyani created the “We Ride in Iran” project. 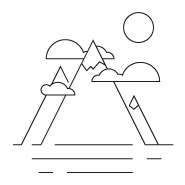 The main idea behind it is to build up a local free-riding community as well as to train the local skiers and snowboarders. Their first meeting in Teheran in 2013 marked the beginning of building up a strong free-ride community in Iran. There is an inspirational film created as part of the project that will make you think seriously about visiting Iran. 1395. This is the current year according to the Iranian calendar. Iranians celebrate their New Year (Nowruz) on 21 March or the day of the vernal equinox. This is a time of family reunions. Many Iranians take a two-week holiday leave, so streets become completely deserted and shops are closed. They do not return to work until the beginning of April. Chaharshanbe Suri or the Festival of Fire, which falls on the eve of the last Wednesday before Nowruz, goes back to the early Zoroastrian era (some 1700 BC). The forthcoming event will be held on 14 March 2017. You can see Iranians dancing, singing in the streets, and jumping over an open fire. Cash. Western credit and debit cards are good for nothing in Iran. Cash holds sway. You need to use a well-tested method, i.e. a pouch with cash strung around the neck. And we guarantee that after the first visit to the exchange office (no problems with exchanging euros or dollars) you will become millionaires! Instead of two or three meagre notes, you will get a sizeable wad of rustling local notes. Although the “toman” is not an official unit of Iranian currency, it is frequently used. One “toman” equals 10 Iranian rials. Please bear that in mind while paying in shops. Damavand. The highest peak in Iran (5671 m). This dormant volcano is set in the middle of the Alborz range. In Zoroastrian mythology, it is the seat of a three-headed dragon. Facebook. The Iranian authorities like to have social media under control. Facebook and Youtube are not accessible, but Iranians use Instagram and WhatsApp. However, as the saying goes, where there is a will, there is a way, and there is special software that helps circumvent the ban and get access to blocked services. So as contingency, it pays to have such software on your smartphone or notebook. Actually, Iranians remain on-line as much as the whole western world, and you can see that by looking at the smartphone screens in Teheran. Gondola lifts. What is rather boring and foreseeable in the Alps is an extra attraction in Iran. Take the skiing infrastructure for example. Getting inside to old school gondolas becomes a litmus test. Fairly tight as they are and with little room for skis, they can hardly close, unless a forceful kick from outside does the trick. Ask Iranians about the local skiing infrastructure, and they will invariably say that their gondola lifts are the same as in the Alps. Point taken, but they are at least 20 years older. Truth be told, they work beautifully, and all we need to do is to learn the sardine packing technique. Lahestan. It pays to remember this word, since words like “Poland” or “Pologne” will not mean much to Iranians who ask you about your home country. Lahestan is Poland in Persian. And we guarantee that you will be greeted with a smile and kindness! Persians. Iranians are sensitive to their ethnicity, and any identification with Arabs, a mistake tourists tend to make frequently) is frowned upon. Although Iranians are part of the same world of Islam, they will always underline their own national identity. Same, same… but different! Largely for political reasons and because of long-term sanctions imposed by the international community, there are no western brands in Iran so ubiquitous everywhere else. You will not have a cheeseburger at McDonald’s or cafe latte at Starbuck’s. Instead, you will have Mash Donald’s and Raees Coffee, with their logos almost the same as their American counterparts. Subway is dubbed here as Freshway. You will see lots of places with western brands somewhat distorted, but following the signing of the nuclear treaty and the lifting of economic sanctions, Iran is slowly opening its doors to western corporations. Burger King and KFC are already there. Smile. You will soon discover how groundless all the stereotypes of dangerous and unfriendly Iranians are. And you will also find out that travelling in Iran is easier than you could ever think. In fact there are very few places in the world where people greet you in the street with a genuine smile with absolutely no hidden agenda. Given quite different culture and customs, sometimes totally incomprehensible to western tourists, a trip to Iran is like entering a different world. With the exception of the face and palms, a woman’s body must be fully covered in all public places. Some Iranian women wear veils to cover their hair and neck while others use chadors or long cloaks with no openings. Female tourists can do with a veil that covers their heads and adequate clothes, i.e. no low cut blouses, short sleeves or short skirts. Men should avoid T-shirts and shorts. In official situations men and women do not shake hands. However, reality is far less restricted. Iranians are ready to extend their hands to greet others, and women cover their heads loosely exposing a considerable part of their hairdo. Iranian women love strong makeup. 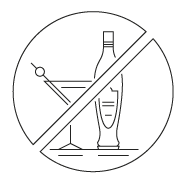 In Iran there is a complete ban on bringing, selling, and drinking alcohol, so you will never see it in shops and restaurants. Non-alcoholic beer is rife (all pretty awful). And while nobody drinks alcohol officially, there are some who brew arak (Levantine alcoholic spirit made of fermented raisins), and in the province of Shiraz, famous for grapes exported to France, you can taste home-made wine provided you know where to ask. Iran has two faces: stringent principles in the streets and in official contacts, and far more amiable and liberal atmosphere once you cross the threshold. 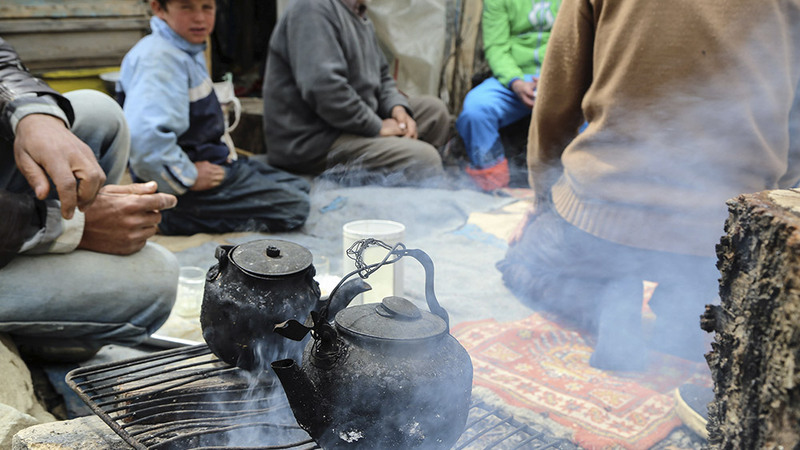 Travelling across the width and breath of Iran you will more often than not be invited in for tea or dinner, and someone will strike a conversation with you in the street or on the slope. 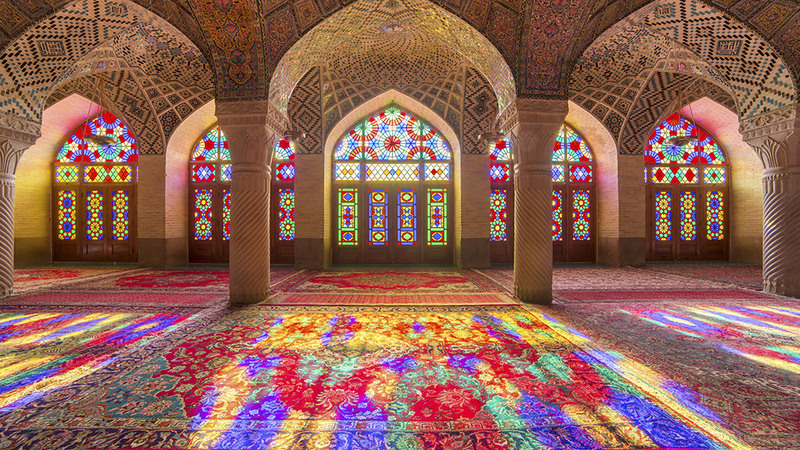 Despite restrictive principles of Islam, Iranians are known for their hospitality and openness. They are very curious about the world and the people who visit their country, so wherever you are, be it a plantation in the countryside or a bustling city centre, you will be surrounded by kind and smiling people. Teheran. Chaos and ubiquitous congestion in the streets. Teheran is like a melting pot with all sorts of vehicles pouring in from all directions. Little wonder, though, if you realise that there are about 8 million inhabitants (almost the same as in New York City) excluding suburbs and Greater Teheran. Being street-wise should be taken literally if you do not want to get stuck forever. That said, Teheran is still a must-see. Huge, overcrowded and enveloped in smog, Teheran is vibrant with life and enjoys a liberal atmosphere of a metropolis. And the mountains that surround the city do make an impression. 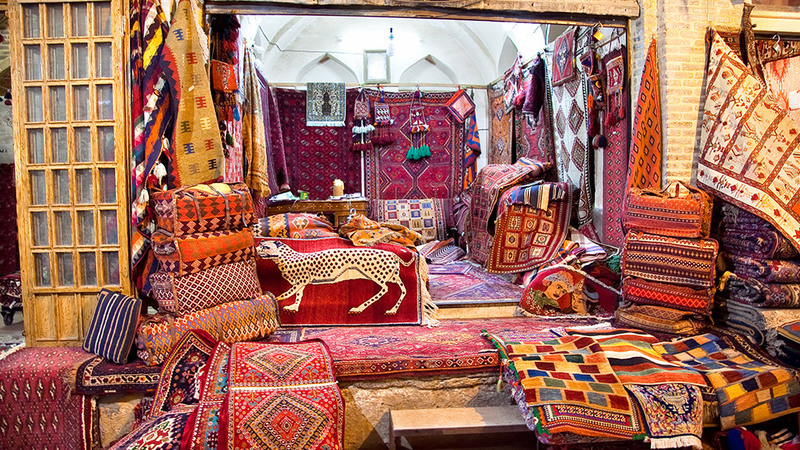 When in Teheran, you must see the Bazaar in the heart of the city – an unusual combination of colours and fragrances. Gigantic jars with red saffron, turquoise enamel plates, copper pots and plates, hand-made Persian rugs, dried fruits, and aromatic herbs – they all become a feast for your sense never experienced before. From there it is just a few steps to Imam Khomeini Mosque with fabulous blue mosaics on the roof top. Entering the temple is like entering a different world (away from the madding crowd). For women, it is an additional challenge, since you need to wear a chador to visit the mosque. You will see for yourself that wearing one is not that easy and comfy. Isfahan. You can have a breather here. Cut across by the Zajandeh Rud River, Isfahan is a green and picturesque tourist resort. Life in the town concentrates around eleven historic bridges with S-o-seh pol or the bridge of thirty three spans as the most famous example of Safavid bridge design. Iranians flock the riverbanks around the bridges to rest, eat, and talk, and at dusk they also sing and dance (although such practices in public places are strictly forbidden). Imam Square (Nasqsh-e-Jahan), a UNESCO world heritage site, is the most popular place to see in Isfahan. It is over 500 m long and it is surrounded with arcades. Friday Mosque (Al-Jum’a), one of the oldest mosques in Iran, is but a few steps away. The must-see list also includes the Abbassi Hotel, built some 3 centuries ago by the Safavid dynasty.